Earlier today, the Indian National Congress hosted an ‘Anti-bullying workshop’ with a panel consisting of Barkha Dutt (who has a history of bullying), Talish Ray, Gurmehar Kaur (who bullied teenagers) and Sanjay Rajoura (an abusive comedian who bullies others on social media). It becomes especially amusing when the Congress party calls a serial intimidator like Barkha Dutt to speak against the threats of bullying. As Barkha Dutt tells the youngsters present at the Congress forum that, “The mob is big and intimidating” for which the best way to fight is being “true to yourself”, people are left to wonder if the advice is intended to reach those who were victims of her bullying, where she herself used her “big and intimidating” position as a journalist, to threaten people and question their right to express. It was back in 2011 when an IIMC student named Yogesh Kumar Sheetal protested against her leaked conversations in the Radia tapes. And the campaigner for “being an individual” in turn celebrated his individuality, by making his life very difficult and doing as much as she could, in her capacity, to sabotage his future. On another occasion, Barkha compelled a blogger named Chaitanya Kunte to take down a blog where he raised compelling questions on her journalistic ethics. The blogger was strong-armed by the news house to apologise, without which he was told to face an entity that has an army of lawyers at its disposal. And so, Barkha forced a blogger to compromise his opinion by sheer intimidation. When Postcard News published an opinion piece, on how Barkha Dutt had breached the basics of journalistic practice, by publicising matters of national security, right from suggesting how “water can be used for infiltration”, to asking hesitant soldiers about their duty timings- she threatened them too. In fact, even the BJYM spokesperson and tax lawyer, Amrita Bhinder, who shared the article, was put through threats of criminal defamation. 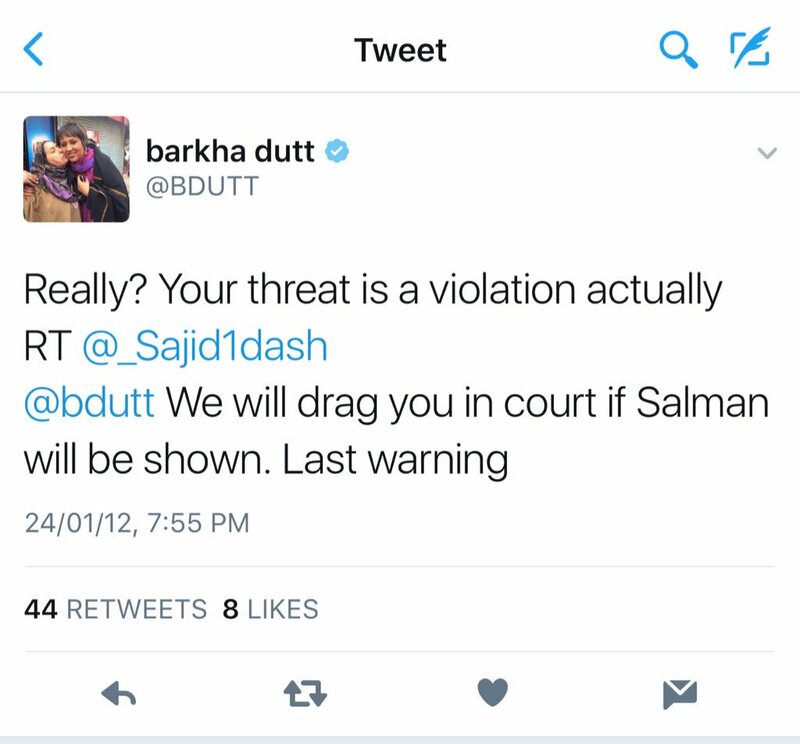 It is interesting to note that when someone else threatened Barkha with a lawsuit, she categorically called it “a violation”. Which goes to prove that Barkha herself believes in absolute freedom of expression and doesn’t endorse legal recourse. However, her faith in absolute freedom of express goes out of the window when others threaten her with a lawsuit. 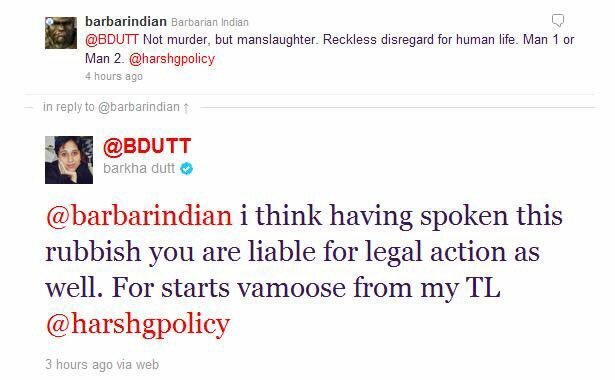 There have been several incidents when Barkha herself used threats of defamation to bully her detractors into silence. 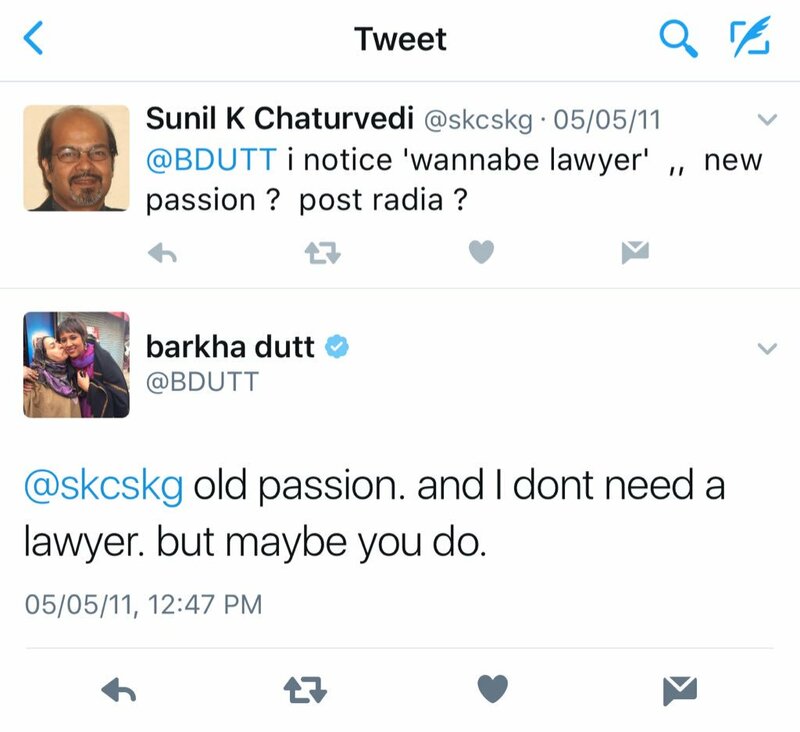 Here is an old tweet where Barkha threatened to sue. 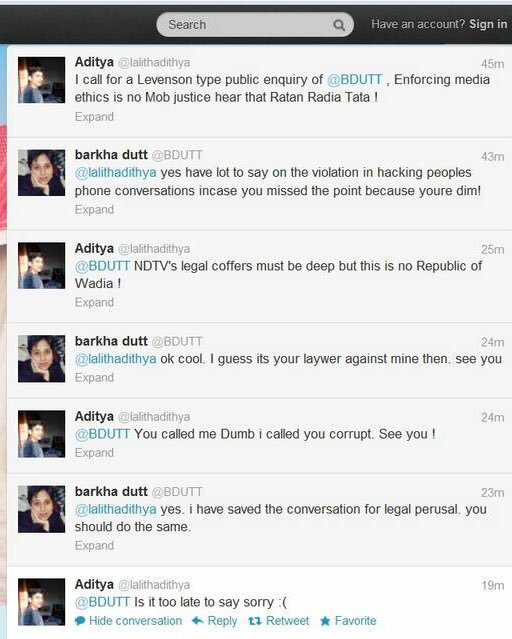 Seems Barkha has a habit of threatening people with a lawsuit for the comments made in response to her reporting. Barkha even thought someone calling for a public enquiry of Barkha Dutt’s journalism should be held liable for his dissent in court. 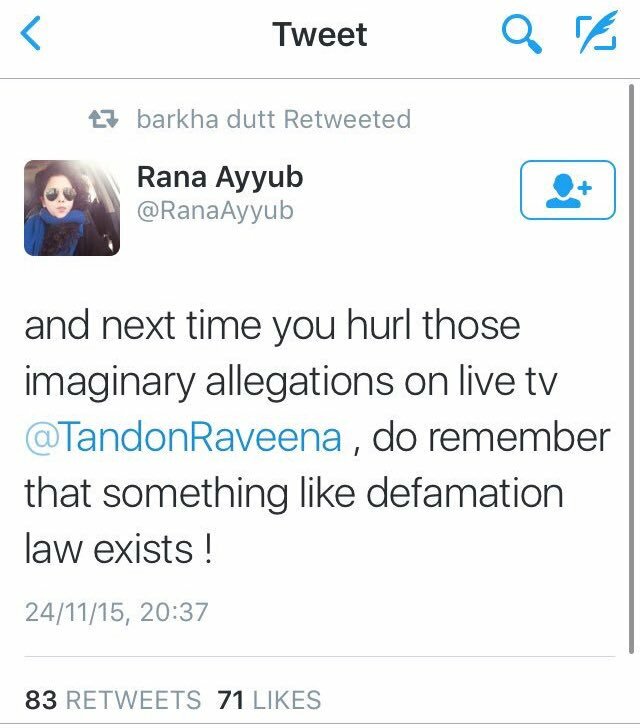 Barkha even ganged up with controversial journalist Rana Ayyuub to bully none other than actress Raveena Tandon for her views. It is indeed a fact that Barkha Dutt was involved deeply in the Radia tapes and that proved her lack of journalistic ethics. But the mere mention of that fact can get Barkha to threaten someone. Barkha is indeed in the habit of slandering detractors with unkind labels while defending the “tukde tukde gang” and painting terrorists as “poor headmaster’s son”, unethical journalism and even spooking the army with her ‘reporting’ during wartime. She is someone who uses a fellow journalist’s death to spread lies and propaganda about those who don’t agree with her journalism. As evidenced, Barkha Dutt also has a history of using bullying and intimidation tactics to shut the voices of her detractors down. For her to be invited by the Congress party, that has its own shameful history with freedom of expression and censorship is nothing short of laughable. The long list of Barkha Dutt’s love for bullying legitimate dissent will go on, for there have been far too many incidents when she has used her position of privilege to suppress real questions on her journalism. And her suggestions on dealing with intimidation, in the recent workshop, were apt for the victims of her own actions. It, therefore, must be well worth submitting that irony died a thousand deaths when Barkha lectured youngsters on the harms of bullying. Maybe we could at least take solace in the fact that after years of pretending to be neutral, she has finally come out of the woodworks to own her bias by being at a Congress event.